Day-four, in Hebrew, does NOT contain any perfect (completed action) verbs. The day divides into two parts: (1) God’s continuing commands and (2) the continuing results of those commands. THE COMMANDS, verse 14 – 15: And Elohim continues to say there shall becoming luminaries in the raqiya of the heavens for dividing between day and night. And they shall be for signs and for appointments (seasons) and for days and years. And let luminaries in the raqiya of the heavens be giving light on the Earth, and it was so. Raqiya is the noun of the Hebrew verb to spread out. Moses used raqiya five times on day two to refer to a spread out atmosphere that separated waters above and below. Day-four uses raqiya three times concerning the luminaries of the heavens. I render raqiya as “that which spreads out” as I did for day two. THE RESULTS, verse 16 – 19: And Elohim continued to make (imperfect verb) two great luminaries, the greater luminary to rule the day and the lesser luminary to rule the night and the stars. He continued to be making them into “things that spread” (raqiya) to be lighting the earth and to be ruling over the day and to be dividing the light from darkness, and it was so. And the evening and morning – day four. What does Moses mean by greater and lesser luminaries? He adds the stars to the list so evidently the luminaries are the Sun, Moon and stars. The text mentions six things about the luminaries. continue to become things that spread out (raqiya). Moses used continuing action (imperfect) verbs for the commanding, making and changing of the luminaries into things that spread out (raqiya). There is no reference to creating the luminaries out of nothing, ex nihilo, as in the traditional, Catholic interpretation of creation. The text suggests that God continued to form them out of the unformed things He created first: the plural heavens and the earth. On day one, He continued to energize and give form to matter as he continued to command light to continue to be. Light is the most energetic thing know and it never stops dithering around within all substances, evidently giving them extension. Moses does not mention when or if the forming and spreading out of the luminaries stopped, only that he began to do this on day four. Several other Scriptures, give us more information on the spreading heavens. Zechariah 12:1 The Lord continues (in unbroken continuity) to stretch out the heavens and lay the foundation of the earth. Isaiah 45:12 the Lord made the earth and the stretched out the heavens (perfect – completed actions). Isaiah 44:24 The Lord (in unbroken continuity) continues to stretch out the heavens and the earth. Why does the same author in one place say he completes the stretching of the heavens and in elsewhere say he continues it in unbroken continuity to stretch them out? Isaiah 51:13 The Lord continues (in unbroken continuity) to spread out the heavens and lay the foundations of the earth. Isaiah 42:5 He continues (in unbroken continuity) to create the heavens and stretch them out. Job 26:7 He continues to actively and in unbroken continuity stretch out the north over the empty place and hang the earth on nothing. The north is the opposite direction from the core of the Milky Way. If the stars continue to emerge from the core, they would spread out over the empty place, to the north. In Isaiah 40:26 we find completed action and continuing verbs in the same verse. He commands us to lift up our eyes and look – He created (completed action) the heavens. He continues (in unbroken continuity) to bring out their hosts, to cause them to come out. He continues to number them and call them out by name, yet none go missing. Huge new telescopes are observing the early universe with X-rays, ultra-violet, visible, infrared and microwave. There are probably more than a trillion galaxies stretching out in all directions to the creation era. Isaiah 40:26 commands us to lift up our eyes and look at what He created and how He continues to call the starry hosts to come out. Psalm 19 says the plural heavens are intensely and continually declaring his glory. The things that spread (raqiya) are causally and in unbroken continuity – showing the work of his hands. He created the heavens and the Earth first, on the first day, but the Sun, Moon and stars did not begin to formed until day four. The use of the noun raqiya on day four strongly suggests that he continued to make things that spread out. The visible history of the universe confirms the literal text. He continued to give form to trillions of stars, that continued to come out and spread out as billions of galaxies continue to grow from the insides outwards. I have combined four NASA images, one of the local M51 (Pinwheel) galaxy with primordial galaxy HUDF 3o31 in the lower right corner. (Right click on the above image and chose open in another tab, to observe the picture at a higher resolution). The Pinwheel galaxy covers an area of about 300,000 square seconds of our sky. Its arms are made of equally spaced star clumps imbedded in streams of dust with a sibling galaxy at the end of one arm. The arms of the Pinwheel have rotated around more than a whole turn. 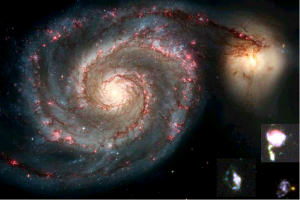 M51 shines at about 99% of the frequencies emitted by modern, local atoms. Hubble Ultra Deep 3031 (in the lower right corner) covers about 5 square seconds of our sky so it is magnified 60,000 times more than the Pinwheel. It has a barred center with two arms of distinct, equally-spaced, blue globs (like beads on a necklace) emerging from one end of the bar, but the arms have only rotated out about half a turn. The lumpy arms shine at higher frequencies than the core, however, on average they shine at about 42% of the frequencies emitted by modern atoms. I included two other galaxies from the Hubble Deep Field in the lower right. 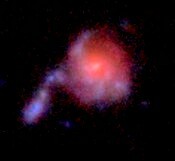 The upper one shows a stream of blue star globs emerging from a redder core along with a primordial tadpole galaxy, a single armed spiral whose arms are made of equally spaced star globs. To the right is an expanded view of HUDF galaxy 4491. A stream of bluish stars globs is emerging from the redder core of this ancient galaxy. Evidently this is an early stage one armed spiral whose arm is just beginning to emerge. What we observe supports a literal rendering of day four. Lift up you eyes and observe that the star streams accelerating outwards (the orbits not closing) along with the atomic clocks. Moses wrote that He continues to form the luminaries (Sun, Moon and stars) and continues to form them into things that spread out. Evidently even the Sun and Moon continue to spread out. Indeed, the optical parallax to the Sun has continued to decrease since the Greeks first measured it over 2,000 years ago. What could cause the stars to continue to form and spread out from point sources as galaxies intrinsically grow? About once a day, NASA observes bursts of intense gamma light arriving from the early universe. Often the bursts appear to come from the areas where arms are forming in primordial spirals. Perhaps this is God continuing to command light to continue to be, thus energizing and giving form to the things he created first. At many ranges, we observe how galaxies grew, the stars continuing to come out and spread out, often growing into huge, local growth spirals. Billions of galaxies grew into huge growth spirals as the stars continued to form and spread out (raqiya). We observe the very things Moses recorded for day four. Clearly what we see involves plural eons. Hebrews 11:3 informs that God commanded the plural eons to passively form out of things not seen. We observe how the star streams in billions of galaxies emerged from things not seen, the unformed matter God created first on day one, exactly as recorded in the literal text. The Hebrew text of day four does not support the western concept of linear time (24-hour fixed length days) although it plainly says counts a sequence of evenings and mornings. How could vast eons fit into only 6,000 years? We observe how the orbits accelerate outwards in countless galaxies, so there is no basis for imagining linear orbits. Indeed, we observe that the frequencies of atomic clocks, the space matter takes up and evidently its inertial properties all change together, relationally as galaxies grow from the insides outwards. How could vast ages fit into less than a hundred generations listed in the Bible? If you lived long enough to observe geological changes, you would grow thick Neanderthal brows from vast age, as Job explained in chapter 14. The days and years have been accelerating as the heavenly bodies continue to spread apart. Lift up your eyes and look, not at mathematical figures, but at the only history that is visible as it happened, cosmic history that only fits the literal creation account. 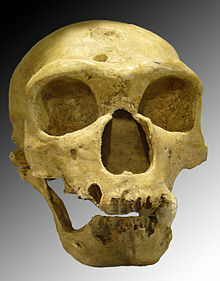 This picture of the La Chapelle aux Saints Neanderthal skull is under the GNU Free Documentation license by Luna04 of wikipedia.